Not everyone likes Mondays that much as they prepare for a busy week ahead at work and I’m one of those people! Although I don’t dread them half as much as I used to now thankfully. 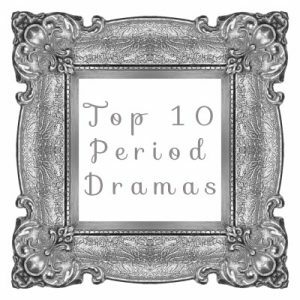 Still, I thought it would nice to write a fun post today about my Top 10 Period Dramas to start the week off in a cheery fashion! Being on a budget means that the hubby and I don’t get to go out that much these days, especially because of the fact that we’d need a babysitter and therefore that would double the expense. So we tend to stay in most of the time and though I don’t watch much TV in general these days (as I’m too busy blogging! ), I do love watching films now and then. My favourite genre of films has to be period dramas or romance and if the two genres are combined, even better! I just love stepping back in time for a while and relishing in the simplicity of a bygone era. A Disease Called Debt is a participant in the Amazon Associates program. By providing affiliate links to Amazon from time to time, I may be able to earn a small commission should a reader decide to purchase an item which I’ve recommended. Any commissions help me to keep the site running and also mean that I can pay extra towards my debts!! I only ever provide affiliate links to sites that are trusted and where I believe the product to be awesome. 🙂 The list below contains affiliate links. If you’re a Colin Firth fan like me and love a good romance, this fantastic version of Pride and Prejudice by the BBC showcases one of Colin Firth’s early and most famous roles as the elegant and proud Mr Darcy. Released in 1995 and featured over six episodes, this mini series tells the story of Mr and Mrs Bennet’s five unmarried daughters and their encounters with the gentleman Mr Darcy and his friend Mr Bingley. Mr Darcy struggles with adapting to ‘country society’ and regularly clashes with the Bennet’s second eldest daughter Elizabeth (played by Jennifer Ehle) who is almost as ‘handsome’ as Jane (eldest daughter). A feel good romantic period drama at its best, I’ve lost count of the amount of times I’ve watched this! There is a rather legendary ‘lake scene’ involving Mr Darcy, the costumes and overall production are wonderful and in my opinion, this version is way better and more authentic than the Kiera Knightly version in 2005! “In vain I have struggled. It will not do. My feelings will not be repressed. You must allow me to tell you how ardently I admire and love you.” Mr Darcy, Pride and Prejudice – Jane Austen. Elizabeth Gaskell’s classic tale set in Victorian England explores how two very different individuals fall in love against the odds. Middle class Margaret Hale (played by Daniela Denby-Ashe) is forced to move to the industrial North of England and crosses paths with successful yet seemingly bad tempered cotton mill owner John Thorton (Richard Armitage). The plot is very similar to that of Pride and Prejudice in that both Margaret and Thornton have to face the prejudices of class and circumstance, whilst battling their affections for one another. Downton Abbey is one of Britain’s best current period dramas with the fourth series gracing our screens each Sunday evening at the moment! Set in post Edwardian England in the fictional Yorkshire country estate of Downton Abbey, this delightful series explores the lives and relationships of the Crawley family and their servants who appear to have a mutual respect and regard for one another. I really like how real life historical events are cleverly woven into the storylines such as the sinking of the Titantic and World War I. The costumes are wonderful and most of the main characters are fairly lovable! Violet Crawley (Maggie Smith) is possibly my favourite character in this with her sarcastic sense of humour and witty timing! This is a great television adaptation of the classic novel by Emily Bronte. Even if you haven’t read Wuthering Heights or seen any of the on screen versions, you’ve probably heard of the two main characters: the famous doomed lovers Cathy and Heathcliff. This is a story about love, obsession, hate and revenge. The plot revolves around the powerful, dark and destructive relationship between Cathy (Charlotte Riley) and the tormented Heathcliff (Tom Hardy). Get the hankies out for this one. Based on the novel by Charlotte Bronte, this BBC dramatisation tells the story of the orphan Jane Eyre right from her childhood where she was ill treated by her aunt and cousins, through to her education at Lowood School before securing a position as a Governess to a child in the care of Mr Rochester. This lighthearted British-American period drama version of the novel by Jane Austen was released in 1995 and boasts a jam packed celebrity cast including Emma Thompson, Kate Winslet, Alan Rickman and Hugh Grant. When Mr Dashwood unfortunately dies leaving his wife and three daughters with a tiny inheritance, they are forced to leave their family home. The story revolves around the lives of two of the daughters, Elinor (Emma Thompson) and Marianne (Kate Winslet) as they move into their new home (a small cottage) and both experience love, heartbreak and eventually happiness. Another fabulous adaptation by the BBC of the classic novel by Anne Bronte this time. The plot depicts a young widow who mysteriously arrives with her young son at Wildfell Hall, which has been empty for many years. She assumes the name of Helen Graham (Tara FitzGerald) and keeps herself to herself before becoming the victim of local gossip. She is befriended by a young farmer, Gilbert Markham (Toby Stephens) who refuses to believe anything scandalous about her. Eventually Gilbert discovers the dark secrets surrounding Helen’s past. I love anything to do with the Royals and this film doesn’t disappoint! This British-American period drama released in 2009 explores the early life and reign of Queen Victoria (Emily Blunt) and her marriage to Prince Albert (Rupert Friend). From what I can gather, this film gives a true insight as to what Queen Victoria was like and it’s truly fascinating! She was so attached to Prince Albert that when he died aged just 42, she wore black for the rest of her reign (another 40 years after his death). Last on my list but by no means least, this is an inspirational film released in 2010 based on a true story about King George VI. Bertie (played by Colin Firth) had been suffering from a speech impediment all his life and suddenly found himself crowned King George VI. His wife Elizabeth – the future Queen Mother (Helen Bonham Carter), arranges help for him by way of an eccentric speech therapist (Geoffry Rush). The King manages to overcome his stammer in order to give the most important speech of his life. I hope you enjoyed my top 10 period dramas list! What about you? What are your favourite film(s) for a cheap night in? Thanks Simon for commenting especially if you’re not a fan of period dramas! My hubby hates them so I have to watch them when he’s away. 🙂 Jane Eyre is definitely a good one though – the book contains all the detail of course but as you say it’s nice to get the vision packed into a movie! We share a love of Pride and Prejudice. The 1995 version with Firth and Ehle is quite simply the finest adaptation ever done. Of course, it is easier to develop a story over 6 hours rather than two that most movies run. I totally agree Kathy! Perhaps that’s why I don’t appreciate the Keira Knightly version that much, they leave so much out I think but probably because they have to in order to pack it into a film. Ooh yes, I love The Sound of Music! I’ve only seen Gone with the Wind once even though it’s so famous. I must check that one out again. The only way I can watch One Born Every Minute is by peaking out from behind a cushion from time to time. I’m kind of fascinated by it even though I’ve had a daughter myself. It’s certainly enough to put off some future parents! My wife and I are suckers for a good period piece. I like your list. If you like Downton Abby (and who doesn’t? ), you might like Gosford Park, too — cool flick. That’s great that both you and your wife are fans of period dramas! I keep trying to persuade my hubby to watch one but he keeps making excuses to escape! I haven’t seen Gosford Park, but I’ll definitely check that out – thanks Mr DB40! Hi Hayley, I don’t watch films (no TV and my computer doesn’t play DVDs), but I do love to read and have several of these stories on my mental to-read list. I am especially looking forward to Jane Eyre and revisiting Wuthering Heights. I don’t think they should have made us read that in high school as I don’t think I understood nor appreciated it. Have a great night! I think that too Tammy – I remember reading Jane Eyre in school but at that time I didn’t appreciate it. I have Pride and Prejudice in book form which I love – I really should get around to reading other classics again! I’m not a big fan of dramas but I love me some good comedy! I just love to laugh! 😛 I used to have an unlimited cinema card where I could watch as many films as I wanted and it was good fun! I don’t watch telly at all. I am actually thinking of selling my TV as it’s a bit of a nightmare to keep moving it from flat to flat! An unlimited cinema card? Wow that sounds amazing, how did you get hold of one of those? I used to watch all sorts of rubbish before I started my blog – mostly soaps! These days I don’t watch much TV at all, but I still like to watch a film now and then. I can imagine moving your TV around is a bit of a pain! You could always watch stuff on your laptop if you suddenly fancied watching a film. BBC iplayer and ITV player have some good films on catch up sometimes. Great list Hayley. I miss this kind of show since moving abroad, as you don’t get a lot of period dramas over here. I’d plump for Pride & Prejudice if I had to choose one to watch. Thanks Robert! Pride and Prejudice is definitely top of my list out of all these. Do you miss the UK much since moving away? Hey, you should watch Corazon Salvaje 1993, everybody loves that drama, many people called it the greatest love story. 80 episodes on youtube. Thanks Andreina! Will check it out!